Browser choice boils down to a matter of either taste or apathy, depending on your technical background. A larger number of IT-savvy people choose Firefox over Windows' default option of Internet Explorer 7 because it's easily customised and there's a wealth of add-ons and extensions available for it. Some people stick with IE out of choice but would like additional features. Whatever the reason for using Internet Explorer, it's good to know that there are some quality add-ons out there that greatly improve the browsing experience. Not all add-ons are worth your time, so to make things easier we've sorted out the most useful add-ons to supercharge Internet Explorer and make it into the browser you've always wanted. IE Spell adds a much-needed spellchecker to the browser, ensuring that words entered into webmail and text entry fields in forms are spelled correctly. It's free for personal use, but any commercial use is subject to charges. It's available at www.iespell.com. Once it's installed, you'll find the IE Spell options in the Tools menu. If you're running a third-party modified version of Internet Explorer and this option isn't available, you can right-click anywhere on a web page and choose 'IE Spell Options' from the dropdown menu that appears. By default the dictionary used is set to US English, but this is easily changed by opening the Options menu, choosing the Languages & Dictionaries tab and setting the language using the dropdown list. On the General tab of the IE Spell options, you can set it to exclude things like web and email addresses, mark-up characters and other common items from the spellcheck. Another very useful feature is the ability to look up any word in a web page using an online dictionary. Just highlight the word you're unsure of, right click and choose 'Look up on…' to open a definition in a new browser window. The default online dictionary is Merriam- Webster, but this can be changed. For an add-on that improves browser security, McAfee Site Advisor is well worth considering. Find it at www.siteadvisor.com/download/ie. Site Advisor adds a toolbar button that provides simple feedback on the security status of the current site using traffic light colours. A green result indicates a safe site, yellow means that it may have associations with unsafe sites and red alerts you to the fact that the site includes unsafe downloads or active content. Sites that haven't been assessed by McAfee are given a grey indicator. Site Advisor also adds its assessments to search results, enabling you to see how safe a site is before you visit it. You can view a full site report for the current page by clicking the downward arrow next to the 'Toolbar' button and choosing 'View Site Report'. In search results, select 'More Info' in the pop-up box that appears when you point the mouse at the Site Advisor rating. Internet Explorer's native search tool is no more advanced than the one included in Notepad. It will search for words in web pages, but you have to do so in a separate window and search for each instance individually. 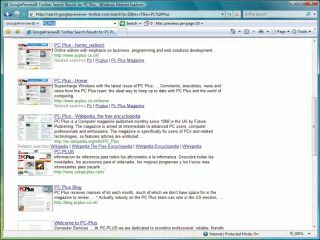 Inline Search mimics Firefox's search behaviour, giving you a search bar at the bottom of the browser window that provides find-as-you-type searching and can highlight every instance of a particular word on a page. It's available to download from www.ieforge.com/inlinesearch/homepage. As search technology improves, getting the right results within the first page has become more common. Most time-savings are now confined to recognising the page you want quickly from the given search results.